OH YES they’re a thing. I was thisclose to sharing something green with you today but then I remembered that I made these caramel apples a few weeks back, it’s almost Halloween and green food can totally wait. Forever. Or at least until later this week. Technically this IS green food? But you get me. I’m fairly psyched about this week since it involves carving pumpkins and an excellent excuse to pound a bunch of candy. I may not like to dress up (though, um, I definitely saw an outrageous DIY mermaid tutorial that I’m dying to do because OMG MAKEUP. Maybe I should be a pregnant mermaid to hand out candy to kids and make everyone feel really uncomfortable. ), but I adore every other aspect of the season and this holiday, minus the scary movie commercials that can be over thisverysecond please. I like to go back and forth between torturing myself by watching a horror film and then having nightmares for days and finding a nightlight a necessity. A few weeks ago I had a serious craving for a caramel apple. Well wait – I hate saying “a serious craving” because I truly don’t feel like I’ve had any serious cravings while pregnant. I actually had serious-er cravings BEFORE getting pregnant. But the truth is that I just really wanted a caramel freaking apple. A green one, which isn’t my apple of choice most days. But the tart and sour apple combined with the sweet gooey caramel was stuck.in.my.head. And I’ve had waaaay too many awful experiences of buying premade caramel apples at the grocery store only to get them home to find them totally rotten on the inside. Plus, they are obviously nowhere near as fab as homemade ones. Two years ago I made vanilla bourbon caramel apples and I knew I wanted something a little different than just a PLAIN caramel apple, but not those exact ones. Of course. Welcome to my internet generation brain where I want something new and different every single day. And nothing plain ever ever. I also knew that I wanted a little chocolate, maybe a little crunch, but not quite as typical as a second dip in chocolate covered in peanuts. What I really wanted was a super gourmet caramel apple that I see in Kilwin’s every summer while in Michigan. That may even be where my desire for one started to brew – Eddie and I almost grabbed one in August but then I was having a weird I’m-pregnant-and-never-hungry moment (though this past weekend I ate like a COMPLETE MANIAC) so we skipped it. I guess it all worked out since I got to make this super trashy version at home – AND pretty much get them all to myself. Can you say an apple a day? I certainly ate one… maybe two, per day after making these. The insides are filled with a chocolate peanut butter ganache, the outside is covered in stretchy caramel and then rolled in a mixture of honey roasted peanuts and sesame seeds. YES. The sesame seeds are key, I tell you. They may not be as cute as rainbow sprinkles… but the flavor is cahrazy good. And I’d really sort of like to be one of those ladies (even though I hate being called a lady and I certainly don’t act as one) who makes homemade treats like this for Halloween but in 2014 that makes you a creep and your hard work ends up in the trash. Add the chocolate and peanut butter to a bowl. Heat the heavy cream and vanilla in a small saucepan over low heat until it begins to bubble around the edges and is warm. Pour the cream over the chocolate and peanut butter and let sit for 1 minute. 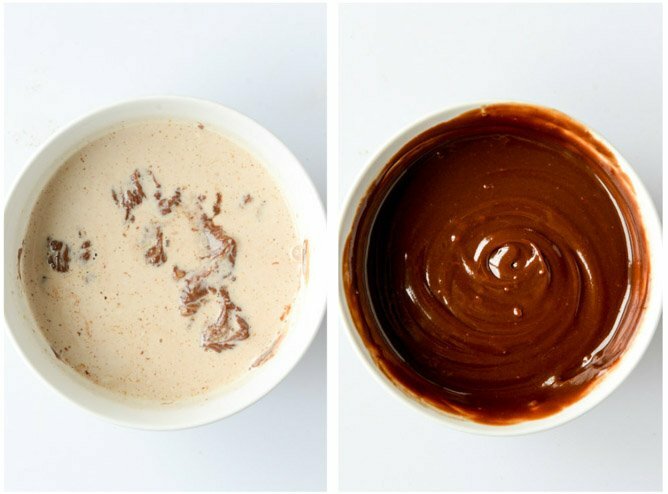 Stir until a creamy and smooch ganache forms. Place in the fridge until chilled. Wash the apples to remove any waxy coating. Use a melon baller to scoop out the bottom stem – just pop it out so you can pop it right back in to hold the ganache inside. Use an apple corer or the melon baller to remove the seeds from the inside of the apple – but stop before you reach the other side. Fill the apples with a few spoonfuls of the ganache. Place the melon balled bottom back into the apple to plug it up. Stick a craft stick in the top of the apple. Add the brown sugar, syrup, cream, butter and salt to a saucepan fitted with a candy thermometer over medium-high heat. Boil the mixture until it reaches 250 degrees, about 15 minutes, watching carefully to make sure it doesn’t bubble over and brushing down the sides with a pastry brush. As soon as it reaches 250 degrees, place the saucepan in a bowl of ice water to stop the cooking. Stir the caramel well with a spoon to mix. Immedaitely dip the apples a little more than halfway into the caramel to coat, placing them on a sheet of parchment paper. Roll them in the chopped peanuts and sesame seeds, then let sit for a few minutes before serving. Keep in the fridge for a day if needed. You stuffed an apple with fudge?!?! Is this real life?! I’m freaking out right now. And to think I wasn’t sure what to dress up as for Halloween—mermaid all the way! Caramel apple-eating mermaid to be specific. I am loving the idea of a pregnant mermaid and making everyone feel uncomfortable. BEST. And a chocolate peanut butter fudge caramel apple? These are Incr-EDIBLE. Pinned! Well these definitely put the ones I made yesterday to shame!! The sesame seeds sound like something I’d like to try! So you didnt stir the caramel constantly as it was cooking? I was so afraid mine would burn that I stirred the entire time it cooked. i’m definitely not a caramel expert, but from what i know from making caramel over the last few years, i don’t think you’re supposed to stir it? just brush down the sides – as long as you use the candy thermometer, that’s how you know it won’t burn! :) p.s. i could totally be wrong. Thats exactly how I make mine, I also thought you are not suppose to constantly stir it. That’s so true that if you make something homemade and hand it out to kids, it ends up in the trash. It’s weird to do that! Right? I think you should be the pregnant mermaid, btw. These apples look divine! Thank you for sharing! I think it’s mandatory to eat a caramel apple once a year, at least. I still have yet to perfect the caramel, though. I love that this doesn’t need a candy thermometer. Maybe I’ll give it another go. WHAT? Amazing. Is it bad I want these right now? 9:30am?? Amazing. I am obsessed with caramel apples and these are seriously beyond! Hahaha a pregnant mermaid ohhhh yes! And I think it’s totally sad that we can’t make homemade treats to hand out :( If I were a kid I would down one of these in a millisecond! Wait…I would still do that! You just took my caramel apple obsession to a whole new level, and I thank you for that! Really? Really? I’m a new reader of your blog and THIS is the first thing I read about? YOU SLAY ME. In a good way, of course, because not only am I high-fiving myself on my decision to add your blog to my Feedly, but also I’m totally jealous of your caramel apple skillz. I just made the plain Jane, tried and true, ones on my blog and you have me BEAT. You’re a genius. Stuffed apples?! Amazing. HOLY MOLY YESSSSSSSS PLEASE!! Mmmm … that PB fudge middle is calling out to me!! OMG these are brilliant, I would eat like 4 of these, k? lol. They look sooooo good! That’s absolutely brilliant to fill the apples up with chocolate fudge! 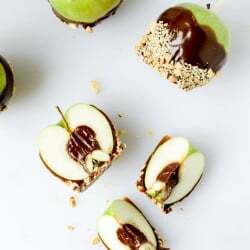 I love these, chocolate and caramel apples with peanuts, perfect! This is amazing Jessica! Stuffed apples ftw! I’m not a fan of super hard caramel covered as I feel my teeth just break every time ha! Holy moly. I don’t even know how to feel right now. Can I just say that I totally agree with you about the whole being called a lady thing? I hate it, even though I’m over thirty so technically I probably am a “lady” and not a “girl.” But I still feel like a girl so there! Here’s to staying young at heart forever! I always know I am in for a good laugh when I read your posts, Jessica! This is definitely a WOW recipe! Ok, these are awesome. And I’ve never heard of stuffed caramel apples!!! I’m sure the sesame seeds are pretty bomb, but PEANUT BUTTER GANACHE STUFFING? I will never eat an un-stuffed caramel apple again. NEVER! A melon baller?! You are brilliant! love these! I love the idea of sesame seeds on a caramel apple…and stuffing the apple? Genius! Clearly makes the proportion of apple and sugar far more balanced! Bond No. 9 is on sale on Ruelala today! Thought you might be interested :) West Side is still available! OMGosh! These look incredible!! I love this time of year too, and have been craving an awesome caramel apple. These are the perfect treat! Stuffed caramel apples!!! As if the caramel apple wasn’t good enough already, now there’s a surpise bonus gift inside. Such a good idea! you always seem to have the ability to approve upon a great thing – caramel apples are great as is, but stuffed with chocolate peanut butter ganache? brilliant! thanks, as always, for the inspiration, jessica. oh. my. days. these seem to good to be true?! I have only made caramel apples one time. 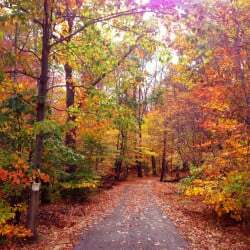 This is making me want to try again! How much fun are these!?!? 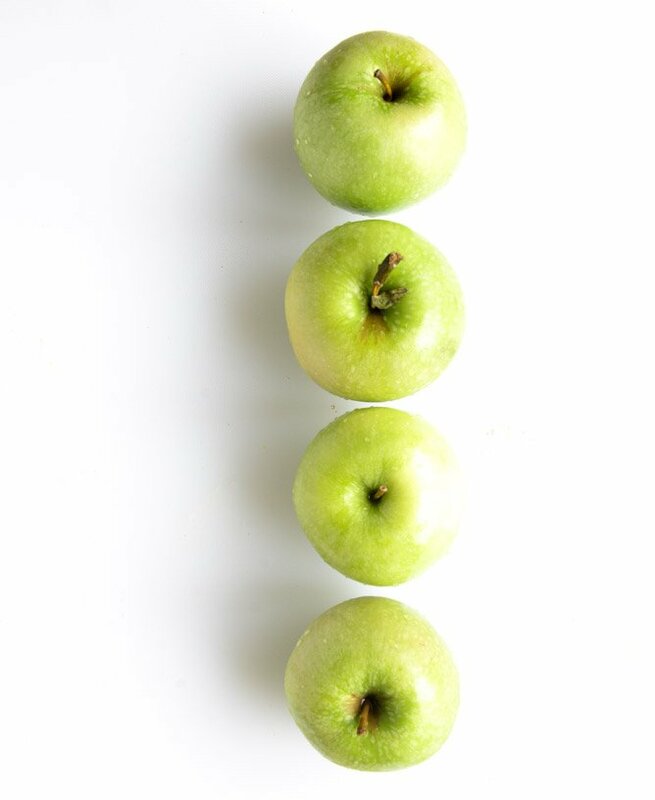 I had a caramel apple week last month on my blog. I LOVE trashed up apples!!!! This looks delicious! I have never heard of stuffed apples! This is THE most AWESOME apple on a stick ever. Oh my goodness! Over the top. This is so so interesting! I never thought of such a treat, nor have I seen anything like it. And I can relate to pregnancy cravings~I was a lot more mellow with my foodieness, and all I wanted was sweet+spicy+sour food like Pho, hah!